Last Saturday I woke up startled with the ringing of the phone on my bed side table. It was the Queen calling me. 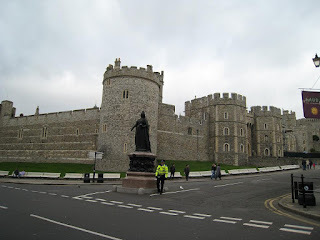 She wailed saying she couldn't understand why after 3 weeks of being here in London I still hadn't paid a call on her since Windsor Castle's just a few minutes away from where I'm staying. I apologized profusely to the obviously heartbroken monarch, couldn't think of an excuse, and to appease her I promised to visit her that day. 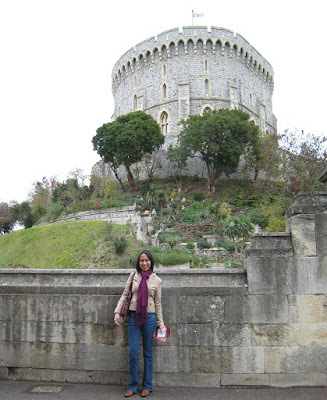 And so I went to Windsor. It was just a 15 minutes ride and one can already see the huge castle as the train approaches Windsor and Eton Riverside station. The first time I noticed it, It took my breath away. It's standing there seemingly proud of it's magnificence. It looks exactly like the castle in my childhood fantasies. The trek up to the castle. A butler opened the grand doors to the Queen's Audience Chamber where the Queen and her husband Prince Philip were waiting. I was amazed at how opulent the room was. There were paintings at the ceiling, paintings by Rubens on the walls, 3 huge chandeliers adorned the room and the furnitures were all cushioned in velvet - simply divine! I must have been gaping silly because the Queen smiled and her husband Prince Philip chuckled. The Queen despite of her age looked as fit as ever. And after 60 years of marriage, she and her husband still looked good together. They graciously showed me around the castle, amusing me with the history of every monarchs who lived there. I had difficulty taking in with my eyes the grandness of the surroundings. I couldn't believe that each chamber looked as opulent as the previous one. 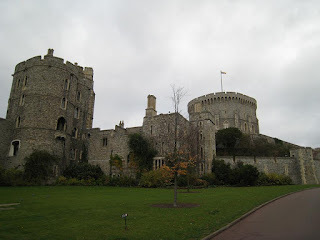 The Windsor Castle - lovely, isn't it? 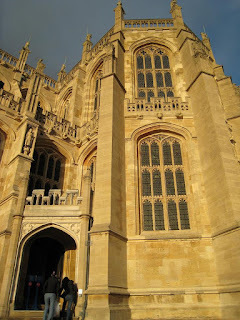 We then went to the St. George's chapel, which was also inside the castle. Walking around the chapel was deeply affecting knowing that many royal marriages happened there, many monarchs walked the same halls, they prayed there and some were laid to rest there. There are a few chantries - built by some royals around the chapel. A chantry is a chapel inside a church (in this case St. George's) endowed for the singing of masses for the chantry's founder after his death. Among the other things showcased inside the chapel are King Edward III's 6'8" sword and the coat of arms of the Order of the Garter knights. 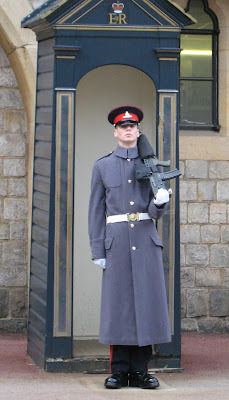 My heart leaped when I saw William waiting for us outside the chapel. He seemed taller than I last saw him but I couldn't quell the feeling of dismay that he's looking more like his father now than his late mother. But still he's handsome. He stayed with us during the afternoon tea and he was very entertaining. William and I share this profound friendship after we decided to let our relationship not move a step further. Because we know we can never be together - a future King can never court, let alone marry a woman of no breeding, no royal titles to offer from a faraway Asian country. The British people will clamor for the downfall of the institution if he'll prefer his desires over his divine duty of governing the country. He has my utmost respect for choosing his that duty over his heart. He's simply returning the adoration the British people have for him - some say they love him more than they love his father. 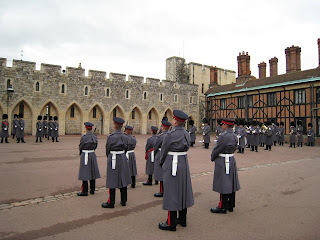 I enjoyed my stay my visit to Windsor, regretting not doing it sooner. I'll call on the Queen again one of these days. Yeah yeah yeah, the above about meeting the Queen and William who has always been the prince in my fantasies were all a product of my overactive imagination. 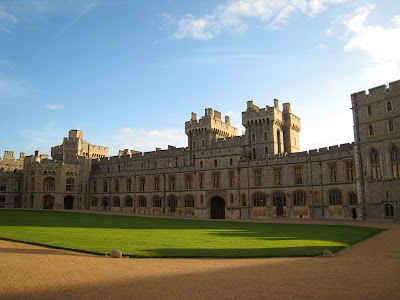 This imagination of mine has been working overtime since I arrived in England :p But I did go to Windsor - and it's every bit as opulent as I described :) Just go to my multiply site for the rest of the pictures. The changing of guards ceremony. Lizette, pwede na ba to for Christmas instead of McSteamy? hala! ka nindot.. pwedeng pwde.. asa naman na?? :D ... uyy.. kaw ako mommy sa?? ?